Historian Betty Huf speaks to visitors at the South Hamilton Lutheran Cemetery during the Schürmann 200th Birthday Anniversary historical tour. Headstone on Pastor C. W. Schürmann’s grave in the South Hamilton Lutheran Cemetery. Book Cover of ‘Clamor Wilhelm Schürmann – Missionary and Pastor’ which was launched on the Anniversary weekend. The cottage of Peter and Agnes Burger, in which Pastor Shurmann conducted services for the Wendish families at Gnadenthal. 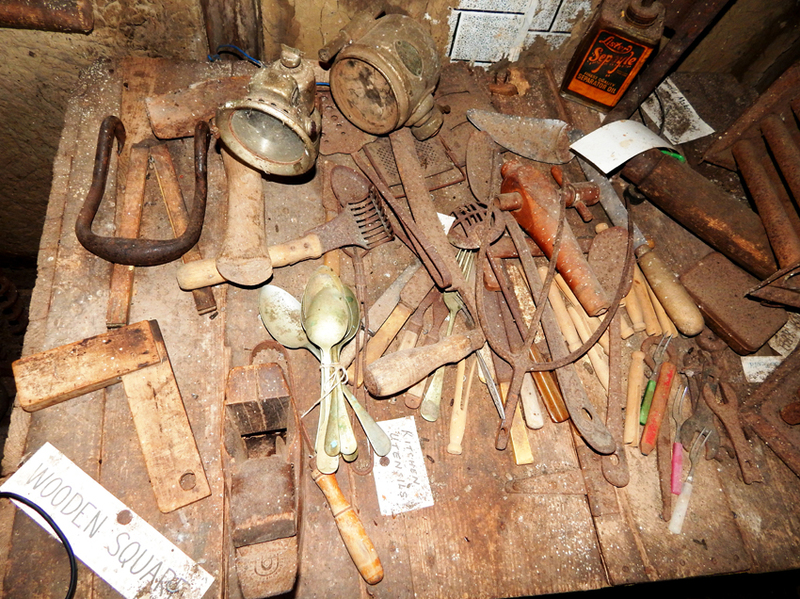 Tools in the Burger Cottage. 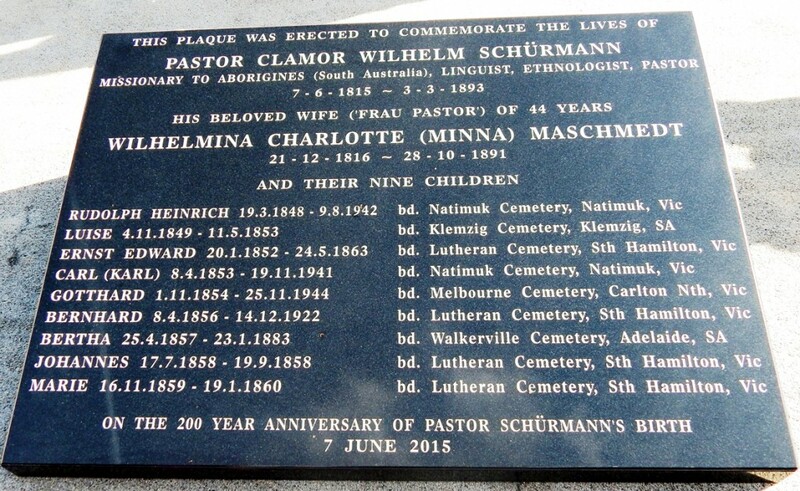 Clamor Wilhelm Schürmann (1815-1893) was the pioneer Lutheran missionary and pastor in Western Victoria, from 1854 to 1893. He was based at Hochkirch (later Tarrington), near Hamilton. 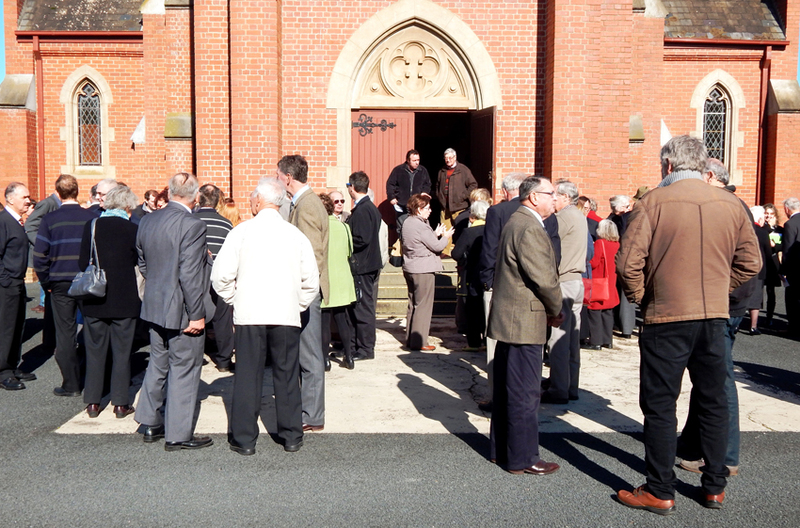 A number of events were held on 6–7 June to celebrate the 200th Birthday of Pastor Schürmann. The following report is written by local historian Betty Huf. Betty co-authored a booklet about Pastor C.W. Schürmann’s ministry, which was launched at this event. Betty was also the tour leader on the bus tour on 6 June. Clamor Wilhelm Schürmann was born in Schledehausen, Hannover on 7 June 1815. He decided at an early age to become a missionary and at the age of 17 began training in Berlin in 1832, transferring to the Evangelical Lutheran Missionary Society of Dresden for further training in 1836. Schürmann, together with C. G. Teichelmann, was appointed by the Dresden Society as a missionary to the Aborigines in South Australia. After arriving in Adelaide on 13 Oct 1838, a site on the bank of the Torrens River was allocated to them for an Aboriginal school. They immediately set about learning Kaurna, the local language, rapidly gaining fluency, and eventually publishing a grammar and vocabulary. They conducted Christian worship, preached in Kaurna as their fluency improved, and travelled far afield to join Aboriginal people in their activities. Some of them became Christians. In 1840, due to the Dresden Society’s financial problems, Schürmann was appointed Protector of Aborigines at Port Lincoln. There he immediately set about learning and recording the Nawu language. When financial support for Schürmann was totally withdrawn he scraped together a little money and bought ten acres of land at Encounter Bay. There, in 1847, he married Wilhelmina Charlotte Maschmedt and they worked their little farm for a year. In 1849 Schürmann was offered a salary to open an Aboriginal school near Port Lincoln. The school lasted for three years with an enrolment of 24 pupils. In 1852 Schürmann accepted a call from Lutherans to establish a new congregation at Portland, Vic. However, his members were unable to purchase farming land until sales were conducted in the Hamilton area in 1853. A Lutheran church was built at South Hamilton but as Schürmann’s congregation grew rapidly, a larger church was built in 1858 in a location which became known as Hochkirch (now Tarrington). This was again replaced by a larger bluestone building in 1863. Other congregations, ministered to by Schür-mann, were established at Gnadenthal, Tabor and Neukirch (Byaduk). 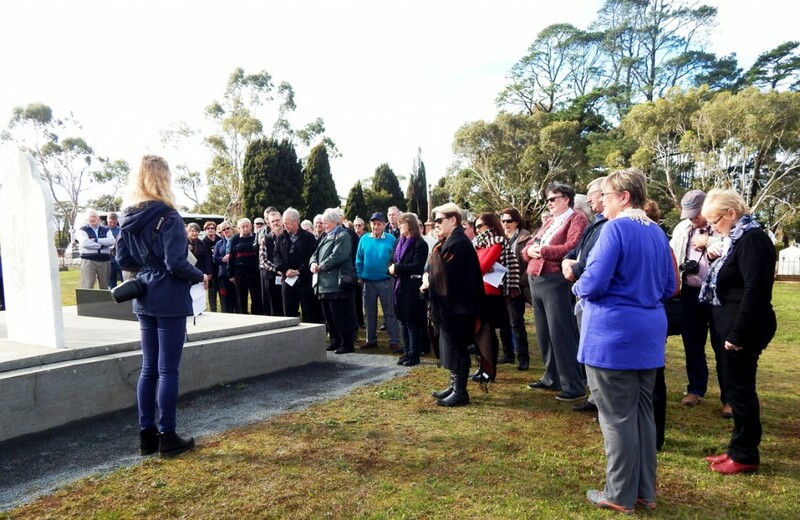 Schürmann also travelled to Mount Gambier, Waldkirch (Freshwater Creek) and Grovedale to visit Lutherans there. Schürmann developed several large and loyal congregations, and ministered faithfully to them for nearly 40 years. ‘Minna’ Schürmann died in 1891. 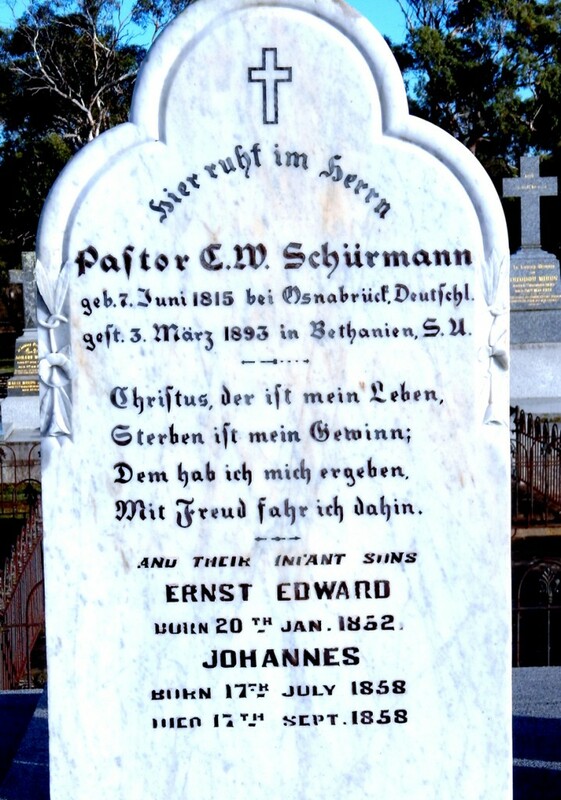 Clamor Schürmann died at the Lutheran Synod at Bethany, South Australia on 3 March 1893. Sunday, 7 June 2015 marked the 200th Birthday of Pastor C. W. Schürmann. A weekend of events was held to commemorate this occasion. On Saturday 6 June, local historian, Betty Huf, gave visitors a glimpse of Schürmann’s life by showing them places in his parish. The tour commenced in the Tarrington (Hochkirch) churchyard, where two churches were built during Schürmann’s ministry, and also where the manse was located. The group then proceeded to the South Hamilton Lutheran Cemetery where everyone paid a respectful visit to the graves of Pastor Schürmann and some of his family members. 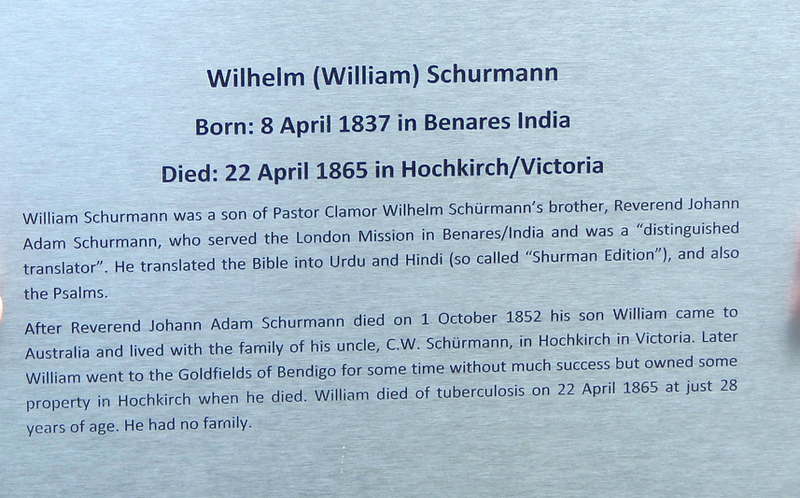 A plaque, donated by Jan and Dirk Schürmann, relatives from Germany, was presented to the Schürmann family by Lara Schürmann (Dirk’s daughter) to commemorate the previously unmarked grave of Wilhelm Schürmann, the son of C. W. Schürmann’s brother Adam, who died while working as a missionary in India in 1852. Wilhelm emigrated to Australia to learn farming from his uncle’s parishioners, but died of tuberculosis in 1865 at the early age of 28. 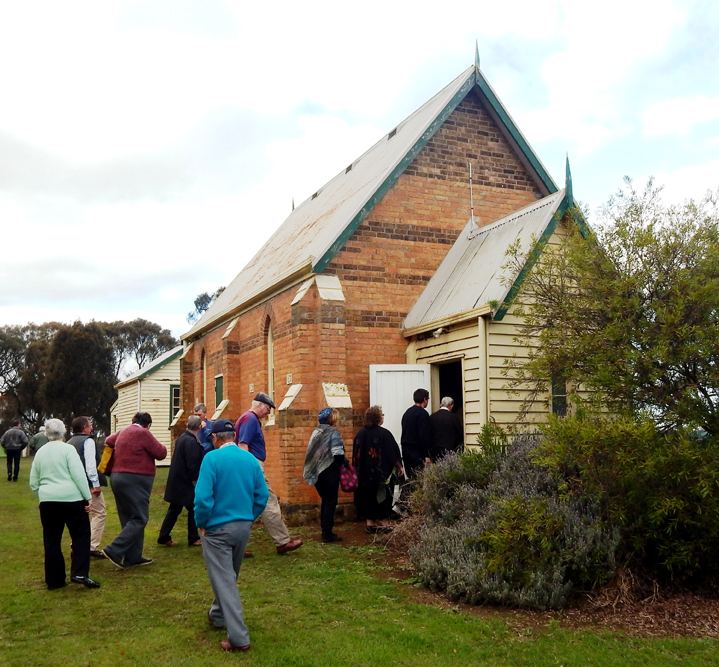 The tour then proceeded past the former St Luke’s Lutheran Church, the grounds of which now house the Hamilton Pastoral Museum. This congregation was formed by Michael Deutscher and other dissatisfied members of Schürmann’s congregation in 1857, who built the red-brick church in 1861. Then it was on to the small church at Neukirch (now Byaduk) where interested tour participants inspected the cemetery and the small church. Although the building was not the one Schürmann preached in, it provided an idea of what its predecessor was like. 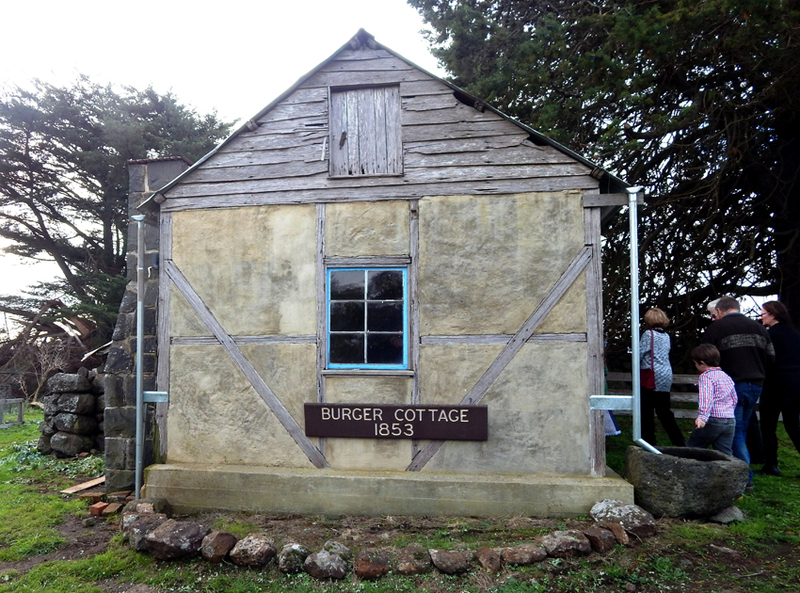 After another long drive to Penshurst, everyone enjoyed a coffee and cake at the Baghdad Café, before travelling to nearby Gnadenthal where the Burger cottage, with its relics of by-gone days, provided plenty of interest for all. To stand in the same building that Pastor Schürmann entered during the 1800s was a moving experience. From there the tour moved to the Gnadenthal cemetery where Schürmann conducted a number of funerals, then on past the Herrnhut Commune site established by Schürmann’s adversary, Johann Friedrich Krumnow. The Tabor Lutheran Church complex was the last place visited. The bluestone church, erected in 1884, is where Schürmann preached many times. Everyone then proceeded on to Tarrington where an Anniversary Dinner was held at Café Catalpa.Guest Speakers were Dr Christine Lockwood and Dr Rob Amery, both of whom spoke of the significant contribution made by Schürmann to the preservation of Aboriginal culture and language in South Australia and the enormous value his work is to Aboriginals today. Some 300 people attended the Anniversary service held at St Michael’s church on Sunday 7 June. This was the day of Schürmann’s 200th Birthday Anniversary. The service was conducted by the Rev. Greg Lockwood, a descendant of C. W. Schürmann. A highlight was the inclusion of some of the hymns and liturgy used in the service held on 21 March 1888 to commemorate Schürmann’s 50th Ordination anniversary. 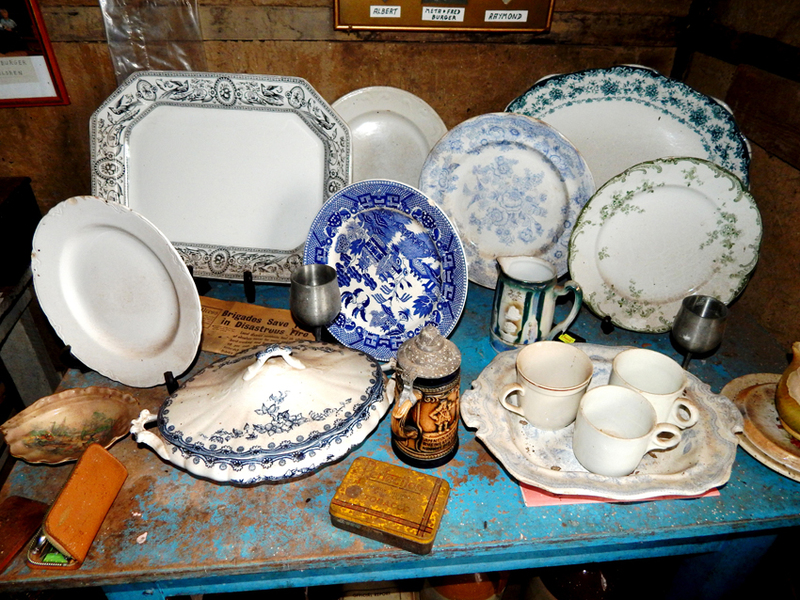 A luncheon followed, during which those present shared family stories, met distant relatives and viewed a display of Schürmann memorabilia. One of the most poignant moments of the weekend occurred when a music box was wheeled out. Pastor Schürmann would listen to the tunes it played after he arrived home from his long trips around his parish. While they listened to Schürmann’s favourite tune ‘Home, Sweet Home’, everyone imagined him hearing that very same song as he tried to relax in his own home after an arduous journey on horseback. The launch of the booklet, Clamor Wilhelm Schürmann – Missionary and Pastor was conducted by Allan Schürmann, with the book signing by co-authors, Dr Christine Lockwood and Betty Huf, concluding the proceedings for the weekend. 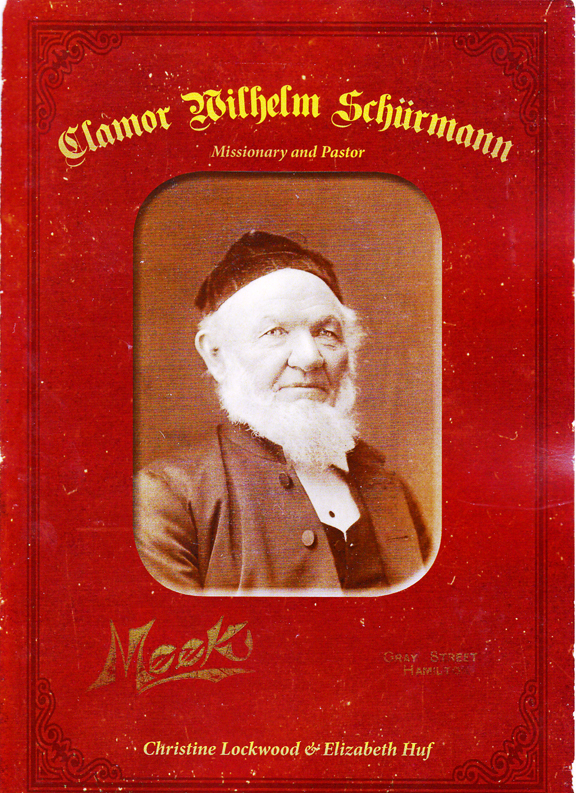 Copies of the booklet ‘Clamor Wilhelm Schürmann – Missionary and Pastor’ are available for $15 plus P&P from Betty Huf, PO Box 26, Tarrington, Vic. 3301.